The driver of a private sanitation truck hit and killed a pedestrian at the intersection of Broadway and Myrtle Avenue this morning, according to the NYPD. The driver hit the pedestrian, a man in his 60s crossing Myrtle, at 7:12 a.m and the victim was pronounced dead at the scene. The police, as usual, do not suspect any criminality on the driver’s part. As Charles Komanoff wrote last summer, this is one in a series of traffic deaths caused by garbage trucks, which seem to be disproportionately dangerous to pedestrians and cyclists. Does anyone know that intersection? Two major 2-way avenues meet at a diagonal, plus another smaller sidestreet (Jefferson). It is underneath the elevated tracks where two subway lines meet (the J/Z and the M) — thus there is a subway stop there with a larger than average foot traffic coming down the stairs. Plus, there are several concrete and iron supports for the train superstructure in the middle of the intersection. Add to that the usual mix of people gunning their cars through the intersection, double-parking on the edge of the intersection, and the utter lack of traffic enforcement in NYC (unless, I guess, we count cyclists in Central Park) —– and you have a recipe for disaster. I bike through there twice every weekday, and I have also driven through that intersection (zipcar) and crossed as a pedestrian. It is dark (underneath the train), loud, chaotic — a challenge in the best of circumstances. Which got me thinking: what if the city pulled a couple of traffic cops from their duties of waving buses into pedestrians in front of Penn Station (I’m sure readers of this blog know what I am talking about) and re-deployed them with the exclusive purpose of protecting pedestrians at an inherently dangerous intersection? That’s a good idea, having the NYPD deploy its resources in a way likely to prevent traffic deaths. The only problem is that the NYPD displays zero interest in allocating resources to prevent traffic deaths. Traffic cops are there to move cars. The NYPD in general is there to facilitate the warehousing of poor people. I see these private sanitation trucks often enough during my late night rides to know that it’s best to steer clear of them. They drive at crazy speeds, make quick manuevers, basically do whatever they can to finish their rounds as quickly as possible. The only reason the carnage caused by them isn’t even worse is because they usually operate when there aren’t a lot of pedestrians or cyclists around. Not related to safety, but can’t they clean these trucks once in a while? I’ll know a private sanitation truck went down a road just by the awful smell which often lingers for 20 or 30 minutes. Say what you will about the NYC Sanitation Department, but at least their trucks don’t have that awful, gut-renching stench. This shows that garbage truck drivers are killing pedestrians and bicyclists 14 times more often per mile driven than other vehicle drivers, and private garbage truck operators are 2/3rds higher than that. That means private sanitation truck drivers are dangerous beyond compare! Bicyclists are told they must yield to pedestrians at all times, even when the pedestrian is in the wrong. Why isn’t this the same for motorists? I think there should be automatic penalties. Aside from whatever summonses are given for traffic violations committed or charges filed (or not filed), there should be a baseline penalty of a 1 year driver license suspension and $1,000 fine for a motorist who injures a pedestrian or bicyclist. And for any driver who kills a pedestrian or bicyclist, there should be an automatic 10 year suspension of their driver license and a $5,000 fine. These are rough ideas, but there should be some automatic baseline penalty just based on their failure to yield. Mr. Komanoff’s article on sanitation trucks is right on the mark, as are the comments on that subject. 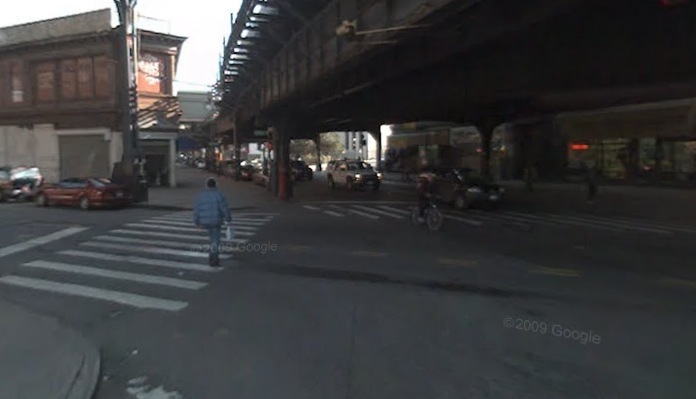 But this particular intersection — where three roads (including two major avenues) intersect underneath two subway lines — is especially, inherently dangerous. Note the light/dark contrast underneath the train line. Visibility at Myrtle/Broadway really is that poor at times. On the google map view, rotate around so you are just opposite from where the “Doritos” truck is turning. The gentleman was struck dead this morning near the pillar in the roadway. Apparantly (according to the Daily News), the guy was crossing the street on crutches, which makes this incident even sadder. Whatever the outcome of this particular case, and whatever the responsibilty that garbage trucks bear for the carnage on our streets (and yes, let’s please talk about that, my point is that this particular intersection is uniquely dangerous, and police resources should be re-deployed from other areas to protect pedestrians. I’ve driven and biked through that intersection–and I agree, it’s incredibly dangerous. As for drawing police resources there, I’d be amazed to see traffic cops trying to protect pedestrians. Fairly often I have to walk down Tillary and cross the Fulton Street Extension on the Brooklyn Bridge side of the street. The pedestrian crossing light is mindblowingly short–going white for something like five seconds before blinking red, and even that stage is short. And even so, traffic cops almost always wave cars and trucks through the white stage of the pedestrian light. One time, the cop waved through an eighteen wheeler that was blowing a red light and coming off the bridge going (easily) forty miles an hour. It’s about a thousand accidents waiting to happen. It’s also a perfect subject for a video–but the problem is you’d get shot taking video of a bridge. Looks like that intersection would be a perfect candidate for a traffic circle. I agree that traffic cops (the ones I have observed, anyway) are focused on moving cars through intersections, and not on pedestrian safety. I think they could be retrained though — and if the NYPD took street safety seriously, they would be retrained as a matter of course. On the five-second walk light: check out the Bike Snob today, he’s got a great video on that exact subject. Well I am so disappointed in this cause this man is my best friends father!!! !This was not suppose to happen and the truck driver was driving at a high rate of speed when he hit him. There are kids going to school at that time in the morning, WHY WHY would u be speeding down a busy street like that. Pops WE WILL MISS U!!!!! The guy that got hit just so happened to be leaving the methadone clinic that is also on the corner Myrtle and Broadway. Go figure. It’s so insane to be on the inside looking out, having the inside REAL info. Media, the greatest illusionist yet.